Past the 7000RPM mark the 2006 K1200GT’s engine spins up with a guttural ferocity and a growling primeval engine note serving notice to whatever the posted limit is that it’s about to be thoroughly trounced. 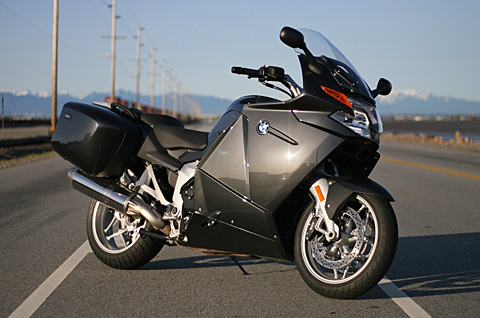 That sound and the acceleration it represents gives the newest bike in the BMW K series some serious X-factor. Normally when you think of sport-tourer with all the creature comforts you’re not likely to be running about ranting on about “POWER!!! !” and using a lot of exclamation points. I can’t help myself from doing it though, and that makes BMW’s new K1200GT a very special sort of wolf in Bavarian clothing. Just listening to the K1200GT’s marvelous post-7,000 RPM hurricane howl, it blows through you, excites you, and is accompanied by whiplash acceleration making you just a little bit scared. That fear shouldn’t be too overwhelming though; BMW re-mapped this laterally mounted K-engine for better midrange and torque over the sportier K1200 S and R. That’s given the plant a baritone wail and electric turbine delivery, with 152hp at 9,500 RPM and a massive 96lb-ft of grunting torque at 7,750 RPM. While those are BMW’s claimed figures I’ve little reason to doubt them. As I clunk through the smooth but still mechanical feeling transmission, the output is like a locomotive just bust loose of its cars – entirely suitable for a bike with a wet weight of 282kg (claimed). The re-mapping also seems to have sorted the fueling issues found at low RPMs in the bike’s ’05 precursors, the K1200S and K1200R, and that makes for smooth linear and exceptionally tractable power delivery. Below 3000RPM, the low end of the rev range might benefit from a bit more pull just to ease low speed parking lot maneuvers. This however may be a matter of finesse and acclimatization to the K1200GT’s power delivery, we should have a chance to do a more complete test later in the year. It would be one thing for the K1200GT to be a road going bullet train, but the GT plays well in corners too. Switching the ESA to “sport mode” I steam into the sweepers. The K1200GT’s turn in is relatively light and easy to initiate for a bike of this size, and with a bit of time I’ve no doubt scraped pegs are the order for the day. The GT does have a tendency to drop into the turns, which can be a bit concerning. The duo-lever front seems vague but supplies better feedback than BMW’s other suspension setup of choice, the tele-lever. I may be spoiled though, having split time the last two weeks between the GSX-R 600 and the Ducati Multistrada both of which take giving feedback to a high art form. Put your faith in the tires and the engineer though, and the K1200GT will likely consume the world’s high-speed curves in huge continent sized gulps, letting you crush the miles rather than tally them up. The next set of curves feature unsettling wallows, and opening the Pandora’s box of an engine I aim to unsettle the newest K. No luck with that, which is fine by me because at base MSRP of $25,600, I’d be hard pressed to scrape up the cost of a replacement. Throughout it all the suspension remains planted and compliant even in sport mode, if a bit on the wallowing side. This performance mode could be firmer, and likely the sport massive will consider the GT soft, but this bike definitely isn’t aimed to pull in the GSX-R 600 crowd. Where the ESA shines is on the rutted, bumped, pockmarked back road, switching to “Comfort” mode the new mighty K sails over bumpy asphalt. You know the scars, potholes and pocks are down there, but they never reach your seat or jar your spine. I could get used to this, maybe “plush” is the new “sport”. At the end of the “rough” run it’s time for a quick U-turn. Actually, it’s more of a ponderous and careful U-turn, it may be me but this duo-lever front end seems to steer wide at low speeds and at a walking pace the K1200GT’s weight makes it a giant’s handful. On the road proper I get a reminder to test the braking courtesy of one of B.C.’s best drivers. Everything is in order here; the servo-assisted system pulls the K1200GT down from speed admirably with one-finger application. A bit of feel is missing in comparison to conventional systems, but this generation EVO braking is a great step forward and with integral ABS makes sense on a sport-Tourer, capital T is intentional. Long days in the saddle may rob you of your finesse and response time and for those times I’m willing to trade a little feel for a good dose of cuddly warm blanket safety. Riding the GT all takes place in relatively serene comfort, provided by a massive fairing that appears to dwarf the actual size of the bike. The GT is a big man’s suit wrapped around a slim man’s body, making the K1200S look svelte, and the K1200R look like a greyhound. That’s fine, because on this it’s easy to think that immersion in the elements is for the little people, you know, the ones that can’t pick up something from this new sport-luxury-tourer class. One weakness in that protection force field is the windscreen, at least for those in the big and tall set. While it may slide up and down in a slow and delicate electric ballet, tall riders will likely find its range on the short side. For myself at 6”2’, in the screen’s highest position the airflow caught my helmet in a clean but loud stream; you may not be giving up on earplugs any time soon. The ergonomics are outstanding and adjustable, with both seat and handlebars featuring a good range of positions. Unlike its touring cousin the R1200RT, you wrap around the GT rather than sit on top of it. It’s a subtle distinction but this contributes to a more sporting feel and a sense of connection with the bike, while the position still maintains a relaxed posture, even for the tall. Indeed, beyond the engine and the front suspension, the RT and the GT share many design elements, making one wonder about the subtle gradations of potential users that BMW are attempting to serve. Design-wise the GT is a sharper more menacing look than previous generations of K bikes, or its current siblings. All that is missing from the bike’s look is someone in a white helmet announcing “Lord Vader your bike it ready.” That sense of design sees a loss of the previous GT’s smooth, strong curves and handsome looks, replaced with slabs of plastic and incisive angles. Of the current crop of Beemers the K1200GT is certainly one of the best looking. 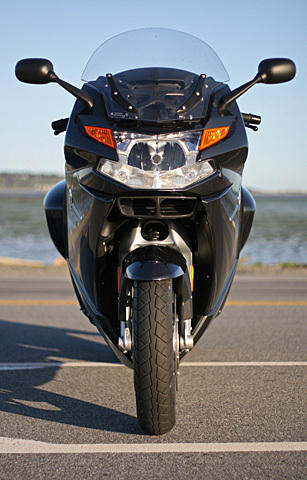 Where the bike’s design is controversial the array of gadgetry falls just short of dizzying. If “God is in the details”, as Einstein put it, then BMW has hired well. The LCD display which gives you enough information to keep you flicking buttons throughout the ride; the range remaining on the fuel in the tank, average speed, average fuel consumption, ambient temperature, oil level warning and even a risk of black ice indicator if temperature drops to 3 °C (37.5 °F) or below. The display also remains on a few seconds after the ignition has been switched off letting you check your mileage, fuel and other details. The analog clocks are well laid out and relatively easy to read and if the numbers on the speedo are small that’s because BMW has had to cram so many of then in! Other details are well sorted. The Xenon headlight, though untested has the promise of night into day brightness. The bags are shared with the RT line, and are hugely improved in capacity, quality and finish; they even have rubber feet to help keep the color-matched bottoms pristine. There are a lot of people who are going to like this next generation GT, primarily the owners of previous generation K1200GT and K1200RS. The K1200GT offers all the improvements the K1200RS owners were calling for, and I should know I was one of them. We wanted an electric screen, better feel, more power, a lighter bike and better handling – with this new K1200GT we got it all. Undoubtedly this bike is a massive improvement over the previous K generation. Given that there are so many sport-touring choices in the BMW line, picking a bike has become an exceptionally subtle selection. The GT is well positioned to woo Sport-touring riders from other brands, many of whom have shunned the R-type engines bikes for their “bag of gravel” motors. BMW’s stated goal for the GT is a “new top-end motorcycle that combines maximum agility and dynamic performance with an ideal package for long trips and pleasant journeys.” Right, “pleasant” really doesn’t sum up ripping a hole in the atmosphere with whiplash acceleration while playing with the ESA (Electronic Suspension Adjustment), gliding the windscreen up and down, and deciding which setting you really want for the heated seat or grips. Frankly that’s an idea I quite enjoy, there’s something entirely ‘civil’ about the BMW K1200GT despite the mad power giving it the potential to be a brilliant touring companion.